Snapchat advertisement for a new era of Digital marketing. Snapchat is a fun based and quickest platform to share images and videos. While this trending platform is dominated by the new generation users, Digital marketers are gradually shifting their ways to it. For most of the top brands like McDonalds and Taco Bell, Snapchat is being treated as important as other digital marketing platforms like Facebook, Google, and Pinterest. SnapChat is a completely transformed generation of Social media where lengthy and boring contents are avoided. Remember, Snapchat is a new generation social media platform. You have to be entertaining enough and most important, quicker enough to gain the attention. Mc Donald’s is leveraging the new Digital marketing trend to its fullest. Recently it turned down $3 billion acquisition offer from Facebook. This made clear that Snapchat is planning bigger, and is going to leverage every user and trend to make its way on the social media platform. Snapchat glasses are the perfect example of the growing popularity of the newest platform. McDonald’s is one of the brands which understands the potential of a new generation Digital marketing; Impacting bigger in a relatively quicker time. 1. Generated awareness and interests on the existing platforms- McDonald’s utilized its popularity and fame on the other social media platforms (Facebook, Google and so on) to educated its current followers about its entry on Snapchat. 2. Short stories and exclusive contents on Snapchat- McDonald’s created short stories and exclusive contents for SnapChat users. It provided leaks and behind the scene look of the new upcoming commercials. 3. Provided exclusive deals for Snapchat friends- McDonald’s promoted its Snapchat profile and encouraged the followers to join then on Snapchat by providing special deals and offers to its Snapchat friends. 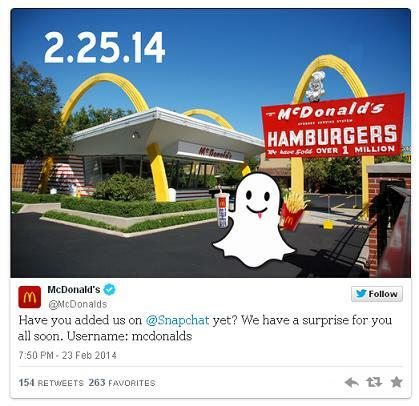 McDonald’s surprise for Snapchat friends. 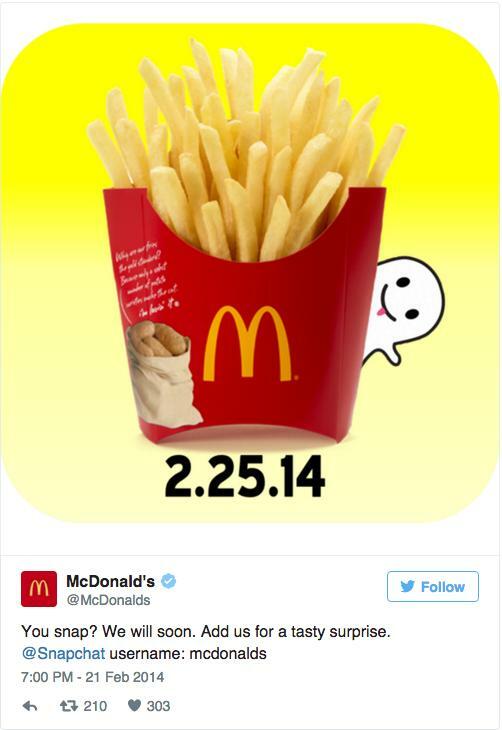 That was a planned strategy for McDonald’s to grab new followers and users for its new Snapchat entry. Like McDonald’s, most of the brands are making their way to the new trend as they do not want to miss leveraging the opportunity to grab the attention of the new generation customers. SnapChat is easy and Fun! The new generation users are finding this new trend to a fun and quicker way to express themselves. The easily accessible videos and contents make it a prime target for customer targeting with a more engaged user experience. The new era of digital marketing can leverage a lot by targeting the users through a Snapchat interactions. A new feature has been added by Snapchat recently- Snapchat Discover. It’s a bit different from the regular infractions on Snapchat regular profiles. It lets the companies and agencies be front and center, unlike the Facebook and Google, where they fight for space. Through the Snapchat Discover space, you can post graphics, text overlays, sounds and animations. It allows the advertiser to have their own separate space and market through unique channels for different publishers. Snapchat is a platform of new generation internet users. People can express their ideas in a relatively quick time. It’s easy to know what your friend is doing. People generally avoid Ads with lengthy contents, and that make the Snapchat a favorite destination as it only allows the videos that are really short. For targeting on Snapchat, your content needs to be a quick one and blended with fun. Snapchat has a great potential for digital marketing. In fact, the early adopters have already acquired a space. The new generation users do not care about the advertisements. They are just attracted to a quick and fun content. If you are planning to take your digital marketing to a new level through Snapchat, it’s better you adapt to it and prepare the contents that are not only engaging but also impacting in a quick time. And, do not forget to carry on your current brand legacy from other Social media platforms to the Snapchat; people do not accept the requests of unknown users on any platform.